ScS has a lot of furniture-shaped history behind it. It started life up in Sunderland, initially as a family-run enterprise in 1894. Fast-forward nearly 100 years and ScS had expanded to 8 outlets selling upholstered furniture. Following a buyout in 1993, ScS cast its net further afield and opened stores all round the country adding larger, more modern premises to out of town business parks. ScS now stocks a wide range of products, from carpets to leather and fabric covered sofas and dining tables. If you’re settling into a new house and need to tackle the lackluster floors, ScS provide a great collection of carpets, vinyl, wood and laminate flooring to give any surface a new lease of life. You’ll be in good company too, as ScS stock brands such as Wilton Royal, Endurance and Hugh Mackay. Once the flooring is down - maybe you’ll realise you need a new sofa. ScS is sure to satisfy all tastes and budgets with a selection of corner sofas, recliners, arm chairs and everything in between. How do I use my ScS promo code? Subscribe to the ScS newsletter to cash in on all sorts of special offers and read up on the latest news. Can I leave a review for ScS? Yes, ScS has partnered up with TrustPilot, the independent reviewing website, so that you can easily leave a review and read other customers’ reviews. Does ScS provide a collection service for old sofas? While ScS doesn’t provide its own collection service, it does recommend a few recycling options on the ‘Old Sofa Removal’ page of the website. Does ScS provide any kind of care guidelines? Yes, go to the ‘Caring for your Products’ page for specific care info on each type of product. ScS offers delivery 6 days a week - Monday to Saturday. For more info about delivery methods and timings, please go to the ScS ‘Delivery Advice’ page. ScS understands circumstances change and that customers may need to cancel or return a product. You can find the full list of terms and conditions on the ‘cancellations and returns’ page of the website. Opening times may vary from store to store, so we suggest finding the store you wish to visit via the ‘Store Locator’ tool and finding the opening times through that route. 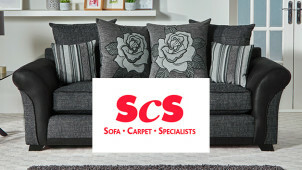 ScS is a home furnishings retailer specialising in furniture, carpets, sofas and flooring. If you’re a serious couch potato, you’d better put your ScS promo code towards one of the uber comfy sofas available online or in store. There are 100 ScS stores dotted around the UK, though you can pick up plenty of bargains while in the comfort of your own home shopping online too. If you know your Parker Knoll from your SiSi Italia, then shopping at ScS is going to make you very happy. In 2017, ScS celebrated opening its 100th store, and to mark this achievement, the management team decided to ask communities all over the country to nominate 100 charities deserving of a donations from ScS - in the size of a £10,000 pot of funds. The funds will be split between a charity per store location. One of those causes includes St Oswald’s Children’s Hospice, as chosen by residents in Sunderland, home of ScS’s first-ever store! Are your dining room chairs looking a bit shabby? Why not put your ScS discount code to best use while purchasing from the fabulous selection of chairs on offer at ScS. Whether you’re into classic farmhouse style or ultra sleek chrome and leather - the ScS chair collection has all tastes and trends covered. If you only need to replace one chair, have no worries - ScS chairs don't have to be purchased in bulk!